SKF TMBS E series - Strong back pullers Reliability Direct, Inc. Your Direct Source for Reliability, Maintenance, Test & Measurement! The SKF TMBS E strong back pullers facilitate dismounting of bearings in applications where the use of traditional jaw pullers is restricted due to lack of space or where the application demands a long reach. TMBS 100E and the TMBS 150E are equipped with a hydraulic spindle, which allows for effortless application of force up to 100 kN (11.2 ton US). 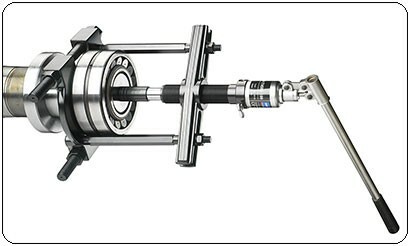 The TMBS 50E is equipped with a mechanical spindle for force generation.